For some people, hops belong on the basketball court and IBUs should run like shoe sizes. This beer is not for those people. This one’s for the hop hungry. This is our monster, hoppy and heady. 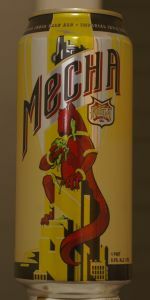 Formerly known as Mecha Hopzilla, this is an American Imperial IPA with a unique combination of four different hops and a half-pound-per-barrel, dry-hop process resulting in a powerful flavor that’s not for the faint of heart. Finally a big beer from NOLA. Tap only for now, and a growler ran me almost $20 at the Avenue Pub in New Orleans. A: Deep, glowing copper. Some visible carbonation. A thin head after a strong pour with chunky bubbles popping actively. S: Wonderfully juicy citrus smell accompanied by some light bubblegummy smells. Most impressive part of the beer. T: Not as sweet or rich as the nose leads you to believe. Quite balanced for a DIPA and decently layered complexity. It starts with an unfortunate wateriness, gets juicy and slightly earthy, and ends with a slow but long hop burn. It's more pleasant than explosive and a little lacking in richness. M: A strike here for a surprisingly thin body. O: This is the first DIPA in Louisiana I know will be extremely fresh on consumption, so there's that. But the mouthfeel is clearly imperfect and the taste disappoints somewhat after the nose. Finally, the price point is cause for balking. NOLA is a small brewery and Hopzilla just debuted last week, but this is an average DIPA priced like a premium one right now. a sturdy and well made double ipa here, honey colored with a faint actually honey character to it, heady and mostly clear, with a ton of hop bitterness, oiliness, fruitiness, and dankness, the full spectrum, and in an appreciably west coast fashion, i dug this one, but could not have a ton of it, its a bit sweet, awfully bitter, and not overly subtle on its alcoholic prowess, it was an easy pint, not necessarily a slow sipper, but a ton of this would ruin a man. hard to place the hops with all the bitterness and countering juiciness here, its both worlds, and while i think more classic northwestern types on the back end, the aroma has me more on a citra and new school, even australian track, tough to place but really complete and delicious, with some stone and tropical fruit, cannabis, and overall intensity. smooth and fuller bodied, well carbonated, sticky even in its dryness, pretty awesome feel here. in a recent extended session of beers from these guys, this was probably my favorite, or darn near it. classic approach, bold and big, i liked this a lot. Worst DIPA ive ever had!!!!!!! Thats why Indiana's 100th ranked beer is as high as Louisiana #1. With that said everything from Great Raft Brewing in Shreveport destroys this beer! A: pours a cloudy orange with a nice head that leaves good lacing. good retention. T: taste good. citrusy hops. orange, pine with a malt backbone to balance. piney hops linger on the palate. O: i was hoping for a bit better, but certainly not a bad beer. Poured from 16 oz can dated 8/31/16 so assuming it's a best by date. Since this is my first beer from NOLA, I'm not sure how they date. A: Burnt orange with a 1-2 finger white head with decent retention and lacing. S: Aromas are fairly light but picking up on some citrus with tangerine and oranges. T: Tangerine, orange zest, and grapefruit mixed with biscuit malts. More malt forward than I was expecting, but maybe it's just an older can. M: Medium body with light to average carbonation. O: Easy drinking and enjoyable DIPA, and one I would revisit especially with a fresh batch. Received as a generous extra from a PALMEJ1 trade, thanks bro. 16 oz can with no freshness date. Pours a dark orange-amber-ruby color with a cloudy body. Head is about 1.5 fingers straight from the can. Average lacing and retention. Not a ton on the nose, some juicy orange, pineapple, citrus scents, with malty sweetness. Surprisingly bitter right up from and carries throughout the beer. Not a lot of hop flavoring to speak of. A touch of malty sweetness. The bitterness really overpowers everything and leaves a stale aftertaste. Mouthfeel is a tad thin for the average DIPA and carbonation a touch low. Averagely dry finish, more of the tongue-numbing bitterness than dryness. Overall, I can't say I was a huge fan of this. Maybe it was old and lost a lot of its hop flavoring. An interesting brew from a brewery I haven't had before, but probably wouldn't try this again unless I knew it was super fresh, and then only to compare to this experience.